We, having hosted the Asian-Pacific City Summit 9th Working-level Conference in Kagoshima City, pledge the following. 1. We will endorse the initiatives presented at this conference, and the opinions exchanged, for building a low-carbon, environment-coexisting, recycling-oriented society. We, as a local self-governing body, agree to contribute towards people and earth-friendly city development. 2. At this conference, we have been able to deepen our understanding of leading waste disposal methods and pollution counter-measures of various cities. We have also been able to learn about the environment together with the next generation of youths, gaining a deeper awareness of what each of us can do, and how our lives are all connected to the earth. 3. As such, we will endeavour to enforce our policies through the mutual teaching of the initiatives presented at this conference, and work together to protect the environment. 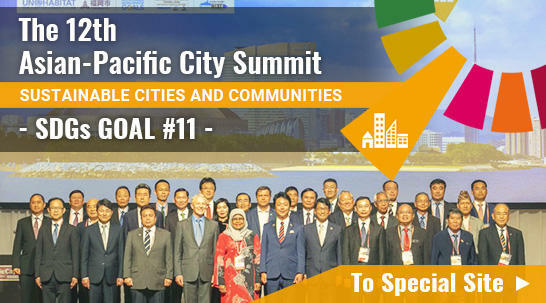 Furthermore, we consider it integral to cooperate with cities beyond our country borders in order to undertake more effective environmental initiatives, and intend to engage in fruitful Mayor-level discussion at the 10th Asian-Pacific City Summit to be held in Pohang City, Korea next year in 28th~30th July. 4. Countless precious lives were lost as a result of the Great East Japan Earthquake, and even now, many people are still living within distressing conditions. We express our deepest sympathies towards the victims of the earthquake and tsunami. We will use the networks established during this conference to spread accurate information pertaining to the site, and provide long-term assistance to restoration efforts in order to fully cooperate with the speedy recovery of the cities and economy. 5. Agreeing to these items declared during the 9th Working-level Conference in Kagoshima, we pledge to carry it on into next year's 10th Asian-Pacific City Summit. The 20th century saw many problems such as worsening of global warming, disruption of ecosystem, and widening disparity. And it is said that economic system in 20th century is pushed to the limit. Asian-Pacific City Summit defines 21st century as "Green Growth Era" which cities address problems, and held working-level conference. At the conference, participating cities introduced efforts for sustainable development by city governments and citizens' organizations, and agreed on the joint declaration for future cooperation. A representative from Iwaki City, Fukushima Prefecture reported how a local government is responding to the Great East Japan Earthquake.